CMH Medical College Lahore constructed between 2006-2009 and was inaugurated by the then prime minister of Pakistan in 2010. It was still functional since 2007. Since its inception, it has achieved the success at the fastest ratio than any other medical college of Pakistan. The project was initiated by the Army officials and corps commander of Lahore approved by COAS after sensing a need for an international-level medical college to cater the needs of CMH Lahore. The main campus in Lahore is a complete blend of perfection in art and architecture; it covers 12 acres of Land in the heart of the city. With theater classrooms that can accommodate 100 students at a time with the adequate sound, audiovisual system and air-conditioned rooms with its backup power generators has left no stone unturned in making it one of the most successful Army Institute in Pakistan in the next ten years. Each department has its dissection and operation rooms, labs, tutorial rooms, and a brilliant faculty. The campus has Mosque, library with 10,000+ books and research papers and journals from all over the world, cafeterias, computer labs, auditoriums and grounds for extracurricular activities. Within 6-7 years, CMH Medical College Lahore has made it to the top by outstanding performances of MBBS and BDS students. since its commencement, the result had been above 92 percent overall in a 5-year MBBS program with 99 percent passing rate for final year students. the students of CMH Medical College Lahore are regularly taking first three positions in UHS Annual exams. An e-library has been established giving access to hundreds of thousands of e-books and Wi-Fi facility to the students, the dissection halls with a capacity of minimum 100 students are constructed and equipped with latest machinery in every department of College. There are hostels for boys and girls and a wide area is allotted for the car park. There are three main departments, the basic sciences, clinical sciences, and dentistry department. The basic science department is made for the1st year and 2nd year MBBS undergraduates, the department of medical education is more like a management unit, it assesses the exams, attendance, and syllabus of students. the other important sub-departments in Basic Sciences Unit are the Department of Anatomy, Physiology, pathology, pharmacology, biochemistry, forensic and community medicines. The clinical sciences department possess sophisticated machinery, up-to-date handlers of that machinery, more capable and experienced staff and professors. It comprises of the department of surgery that is sub-divided to Pediatric, orthopedic surgery, Urology, traumatology, general & plastic surgery departments. There are fifteen other departments along with the cardiac and diagnostic centers. The BDS departments categorized to its ten sub-branches. The department of operative dentistry, maxillofacial surgery, prosthodontics, orthodontics, etc. are working on the dentistry section of CMH Medical College Lahore. CMH Hospital Lahore is now the official teaching hospital of the medical college. It is located near Fortress Stadium in Cantonment area; CMH Lahore is considered the first choice for top-of-the-chain military staff and personals. Along with the final year house job training. CMH receives around 8 lakh patients annually. CMH is at present, working to add the allied health sciences to its policy with nursing and technical medical education added to the system with the accreditation from Pakistan Medical and Dental Council(PMDC). CMH Medical College Lahore is also planning to commence M.phil and FCPS course into the system by 2018. 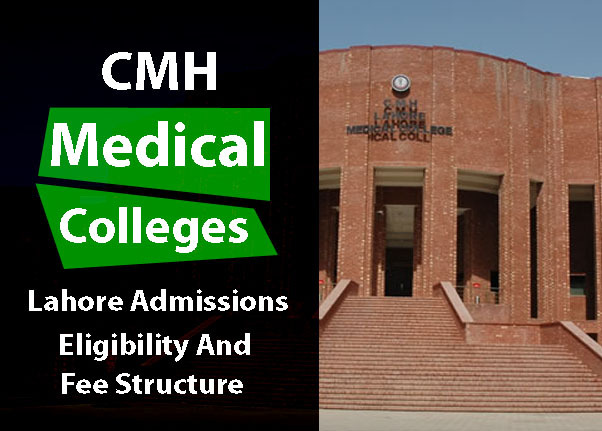 CMH Medical College Lahore is affiliated and recognized by PMDC, UHS, National University of Medical Sciences, Institute of Dentistry, World Directory of Medical Schools (WDMS), a worldwide medical educational program run by WHO, FAIMER, and the prestigious Medical Board of California. The admissions are opened every October for the limited seats in MBBS and BDS in CMH Medical College Lahore. Advertisements of admissions in all the leading newspapers are announced in October. Unlike private and public institutes of Punjab, CMH is an army-run and administered hospital and medical college. It follows dates of NUMS for entrance tests and fee structure; NTS prepares the automated entrance tests for NUMS and its branches. The entrance test is held by National University of Medical Sciences (NUMS) in the first week of November every year. There is a ratio of civilians and army seats for admissions. The final merit lists are announced after two or three weeks, and the names are finalized once all the dues are submitted. The prospectus forms for CMH Medical College Lahore are available from Summit Bank Abdurrahman Road branch against a Rs. 6000 fee challan. For foreign applicants, the processing fee is Rs. 11000 or $110. The eligibility criteria to appear in the entrance test is same as announced by HEC for the higher educational institutes. It is minimum 60 percent marks in the previous FSc. pre-medical examination for Pakistani Student, O/A Level students are also required to score at least 60 percent in their respective exam. For foreign candidates, the minimum scores in SAT-II must be 550 with core subjects as English, Physics, Chemistry, and Biology. The same criteria apply for the previous percentage in scores, 50% marks are accepted from the Aptitude or Entry test of CMH Medical College Lahore, 40% marks are considered from FSc. pre-medical and remaining 10% scores are added from the Matric DMC of candidates. The cumulative aggregate is the final criteria for the selection of candidates on open merit. CMH Medical College Lahore is expensive as compared to the private medical colleges of Punjab. With an admission fee of 50,000 and annual tuition fee up to 650,000, adding other miscellaneous charges and taxes sum up to Rs. 850,000 without hostel and mess charges for local students and estimated 1.1 million rupees per year including them. For international students, the costs are even higher, 1.8 Million Pakistani rupees are charged from foreign students every year. The hostel charges are Rs. 72000 annually, with AC service, the room charges are Rs. 1 lakh per year.